Fade In's clean design and easy interface allows screenwriters to focus on words, not formatting. Fade In takes care of the minutiae for you, such as numbering scenes, and it tracks the data intelligently. That is, it knows you've begun a scene when you use the "Scene Heading" style. The scene then shows up in the navigation sidebar. If you need to move a scene around, you can do so from the navigator, so there's no need to select and cut blocks of text. You can link a sequence of scenes together (for example, an exciting chase might consist of many small scenes that intercut), and move the entire block at once, but the individual scenes remain individual and can be rearranged within the sequence, or removed from it. The tutorial will take you through the earliest steps and show you how to quickly change styles or what automated responses to expect. 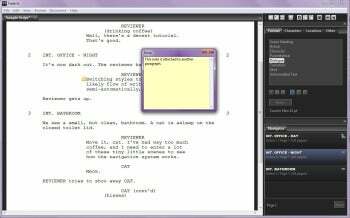 Likewise, Fade In is clever about changing styles as you type to follow the usual flow of scriptwriting, from scene to description to character to dialog. You can manually change styles as well, and the actual look of the styles can be edited as desired. It can identify character names as you type, and you can change a character name and see that name change throughout the script. It likewise makes note of locations, and it will offer pop-ups as you type if it thinks you're typing a location or character it knows. You can attach notes to any paragraph, and summaries to any scene. Reports show such things as characters and how many lines of dialog there are, or how many locations have been specified. Revisions made to a script after filming begins can be color-coded, following the standard Hollywood script color scheme. The color changes apply to each revised page, and move in sequence from white to blue to pink and so on. Again, Fade In lets you override the default colors. Fade In can also "lock" scenes so that no matter where they are in the script, they will be tagged with their original page and scene number. This is necessary to keep scenes intact after filming has started. Fade In saves scripts in its own format (.fadein), but can also save in plain text, PDF, HTML, and Final Draft formats. It is also capable of reading Final Draft output, so users of that program can see how Fade In works with an existing script. Printed output offers not just the script, but the ability to print earlier revisions or character sides (sections of the script pertaining to just a single character). I have only a few minor complaints about Fade In. I found a few interface oddities and annoyances, such as having to click back in the edit area after clicking a new style, instead of being able to continue typing. The note window closes with a close box, not a save button; it was not immediately obvious that your edits would be saved, as usually closing a window via the "X" box either deletes the contents or prompts you to save them. During testing, I found a small graphical glitch, which has since been corrected; Fade In is updated on a rapid cycle, addressing bugs and adding features constantly. The demo version of Fade In contains nearly all the functionality of the full version, though it prints a watermark on output and pops up reminders about registration after your script has grown beyond ten pages. At an introductory price of $50, Fade In is quite reasonable if you do any scriptwriting, or intend to; the ease of use over a generic word processor for this purpose is instantly obvious. At the full price of $100, it would still be a good deal, but less likely to appeal to the casually curious. The demo has no time limit, so a potential buyer can experiment a lot before committing. Fade In gives you the tools to produce the next "Citizen Kane," or the next "Mansquito vs. Megacroc."